“We never get crowds like this except for Comicon,” said the flustered event manager at the Union Square Barnes & Noble last night. I turned around from the plum seat I had snagged by showing up two hours early to see that there were easily more people there than had been at my college graduation. I was hardly surprised—I’d expect nothing less from Junot Diaz, the Pulitzer Prize-winning author of The Brief Wondrous Life of Oscar Wao. He had come to Union Square to read from and sign his new story collection, This is How You Lose Her. Meeting writers is often a bit of a letdown—their charm and intrigue emanates, I think, at least partly from the shield that the medium places between them and the viewer. It’s similar to radio personalities, whose mystique is often supposedly ruined by meeting them in person and having a face and mannerisms to match to the iconic voice. Writers have it even worse when they crawl out from their Proustian dens: both their voice and appearance are now available for scrutiny. I had English professors in college who said they never went to readings because they couldn’t take the magnitude of the disappointment. As a starry-eyed freshman in the first month of college, I went to see Don DeLillo read, and since then haven’t been able to get his dreary, tired bus-driver voice out of my head when I read his work. Yet somehow, still expecting disappointment, people turn out in droves to meet writers. 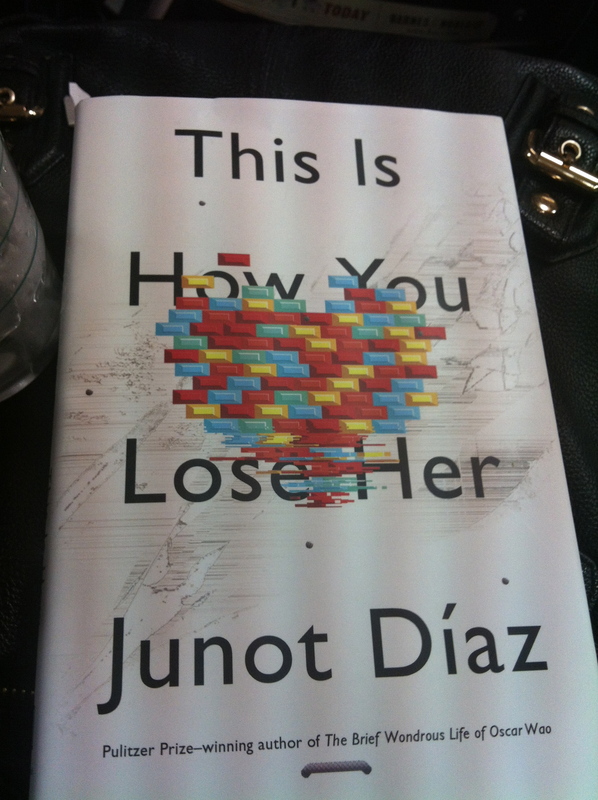 So when my friend texted me that Junot Diaz was reading that evening, I really couldn’t say no. No bus-driver voice with Diaz—approaching the podium, he got up, realized he didn’t have his book, and asked someone in the front row, “Hey, can I borrow your book, bro?” I knew then, beyond a doubt, that he would be every bit as vibrant in person as his personas on the page, and he didn’t disappoint. “The safety of work unrealized,” he continued, “does not in any way compare with the beauty of flawed work realized.” To that end, he suggested that the main difference between published and unpublished writers is that published writers are less afraid of “sucking,” of vulnerability. His speech, like his writing, was a vibrant mix of street slang, eloquent social and literary commentary, sci-fi references, and the occasional Spanish aside that routinely sent about half the audience into stitches. He spoke about the book he’s working on now, which explores a world in which the only person who could save the world was someone the world had utterly mistreated and rejected: a little dark-skinned girl, he said. And this maligned heroine will be the superhero that has to save the world. The idea of superheroes runs strong in Diaz’s fiction—in Oscar Wao he makes a masterful parallel between the Dominican immigrant experience and the hyperboles and extremes of sci-fi and fantasy. They’re the only way, he postulates, that you could ever explain, ever tell a thing like that. Sitting in that charged and joyful room on Tuesday evening, I thought the event manager’s mention of Comicon was quite relevant. Who’s more of a literary superhero than Diaz, the author who managed to start a book with the phrase “GhettoNerd at the End of the World”? It was a superhero’s turnout, to say the least, and really lovely to see that people will still fill a room to see a fiction writer. P.S. New York Tip: I had no idea, but this Barnes & Noble is constantly having free events with amazing authors. As in, Zadie Smith and Irvine Welsh later this week and Salman Rushdie the next. See their event calendar for details. ← Nomad Espresso: Godshot, No Fire No Glory!